If you know me personally, you know I love meat-sourced proteins. I’ve had it all (well, almost all). From head cheese to beef tongue, your run of the mill chicken (and not so run of the mill frog legs, which taste like chicken) and steak. Oh boy do I love a good steak. Every once in a while, I find I need to give the meats a break and just go with the veg. That’s not to say I don’t have vegetables with all those meaty meals (my plate’s usually loaded up with vegetables as well) but there are days where an nice light meal is on the menu and it’s sans meat. This pasta is one I could keep eating if it weren’t for the wicked garlic breath that follows and the fact that all that pasta carb-y goodness just doesn’t sit well with me in large quantities. Moderation, I keep telling myself as I sneak back for seconds, and thirds, and… no, I’ll stop there. I’ll even go as far to say that G, who is a devoted carnivore (well, technically omnivore as he does eat vegetables) really enjoys this pasta every time I make it. Quick and easy for a work night dinner with minimal prep and minimal stovetop heat. It’s a great one for the summer months. 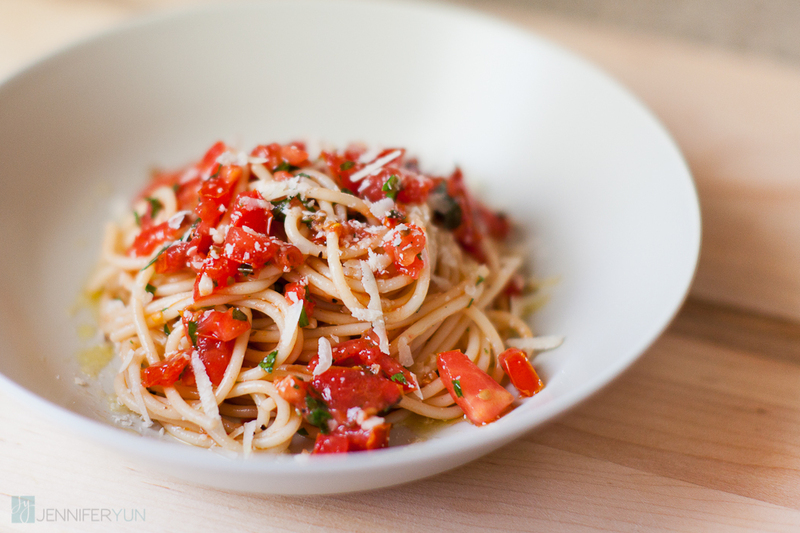 Mix the tomatoes, parsley, basil, garlic, salt, pepper, chili flakes, and olive oil together in a large bowl. Bring a large pot of salted water to boil. Add pasta and cook until al dente. Drain pasta and toss into large bowl with the raw sauce while the noodles are still steaming hot. Serve with a sprinkle of grated Parmesan and drizzle with olive oil. Dig in! Recipe Keynotes: Light, garlicky pasta bursting with tons of fresh flavour.